Another in the ever-growing line of Galaxy S phones, the Samsung Mesmerize on U.S. Cellular ($200 with a new two-year contract; existing customers don't need to sign a new contract to get same price) is a great addition to the Galaxy line, and to the list of all Android smartphones. Although virtually identical to both the Fascinate on Verizon and the Vibrant on T-Mobile, the Mesmerize is actually better-designed than its siblings. Though, as noted, this phone is nearly identical to the Samsung Vibrant, it is slightly lighter (0.34 ounces lighter, to be exact) and a bit taller. Coming in at 4.92 by 2.53 by 0.39 inches, the Mesmerize won't feel bulky in your hand or pocket. Like its Verizon cousin, its sleek and streamlined design feels very reminiscent of the iPhone 3GS. The first thing you tend to notice about the Mesmerize is its touchscreen--gorgeous, 4 inches in size, with Super AMOLED, 800-by-480-pixel resolution, and brilliant color. And I found the screen to be readable outside, even in bright sunlight. Near the bottom of the screen you find the usual Android soft keys (Menu, Home, Back, and Search), and at the top of device you have a standard 3.5mm audio output port along with a micro-USB port behind a small sliding panel. On the left side is the volume rocker, and on the right, the power button. The back has a 5-megapixel camera (with flash) and an external speaker. Packing a 1GHz Hummingbird processor, the Mesmerize is no slouch. Games played buttery smooth, and the phone never really felt sluggish, even with multiple applications operating simultaneously. The only time the device had a significant lag was when it was running a Live Wallpaper, but even then that didn't make the device unusable. Over both Wi-Fi and 3G, applications downloaded in a very speedy manner. Web pages, even media-heavy ones like PCWorld.com and Hulu.com, loaded with ease (of course, you can't play Hulu video, as Hulu content isn't yet licensed for mobile use). Calls came through clear, with no noticeable hiss or static on either end, but note that the model has no noise-cancelling secondary microphone, so background sounds are not filtered out. Battery life is average; as with most smartphones; you will want to charge it daily. TouchWiz 3.0, the user interface on all of Samsung's Galaxy S phones, is here, too. TouchWiz, like HTC Sense, features custom widgets that act as your social aggregators, giving you quick updates at a glance. I personally don't like TouchWiz, as it feels cartoony. Aside from TouchWiz and a few apps, the Mesmerize is a very basic Android 2.1 (Éclair) smartphone. Unlike Verizon's Fascinate, U.S. Cellular was kind enough to leave Maps and Search alone instead of replacing them with another service like Yahoo or Bing. Typing on the onscreen keyboard was never something I dreaded. Thanks greatly in part to its wonderfully responsive screen, I was able to write several long e-mails with very little effort or frustration. Although set to the stock Android keyboard by default, you can also choose between the Samsung keypad and Swype depending on your preferences. The 5-megapixel camera on the Samsung Mesmerize performed admirably. Even in low-light settings, pictures looked great. Videos came out clear and picked up sound reasonably well. I was happy to learn that the stock YouTube app on the device was able to play high-quality videos right out of the box (but I recommend watching them on Wi-Fi, as over 3G they may take a while to load). The Mesmerize comes with a 16GB microSD card (to complement its 2GB of internal storage) as well as headphones; however, you'll most likely want to swap those headphones for a better pair. Like other Galaxy S phones, audio playback is crisp and clear enough that you can easily use the phone as your default MP3 player. And despite my gripes about TouchWiz, I really like the superior TouchWiz media player. One preloaded app that caught my attention was AllShare. It lets you share media between your phone and other DLNA devices over Wi-Fi. Playback through AllShare was so-so (a lot of traffic, though, was running on my home network at the time of testing). 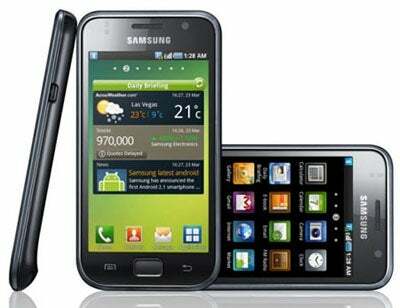 The Samsung Mesmerize is a strong contender in a mobile market currently flooded with Android phones. With a stunning touchscreen, a fast and responsive user interface, and great overall call quality, the Mesmerize is poised to be the new pack leader of the Galaxy S series. U.S. Cellular stores and support are limited to certain areas, but I would greatly recommend picking up this phone if you are within the carrier's network of coverage. The Samsung Mesmerize packs power and a brilliant screen in a sleek and stylish design.